This week, the Elementary and Secondary Education Act—the largest federal program designed to improve education, particularly for disadvantaged students—is up for revision in the Senate. This review gives Congress a unique opportunity to improve our education system and to make significant strides against the record numbers of children in poverty by expanding federally funded early childhood education programs. This column examines how millions of children living in poverty are falling behind academically and how increasing the availability of early childhood education, or preschool, can help. A striking number of children in the United States are poor. The latest Census data reveal that in 2010 more than one out of every five U.S. children lived in poverty conditions. Minority children show the highest rates, with nearly 40 percent of black children and 35 percent of Hispanic children falling below the poverty line. 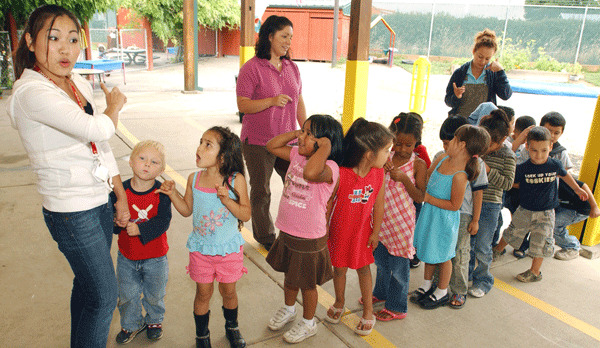 Latino children comprise the single-largest ethnic group in poverty, with 6.1 million children in poverty in 2010. These young children suffer in the classroom: Poverty-stricken youth show higher rates of academic failure and an increased probability of grade retention. Children from poor families are twice as likely to repeat a grade, and they are about 10 times as likely to drop out of high school. These outcomes are likely due to the fact that poverty saddles children with a seemingly insurmountable disadvantage at perhaps the most critical time in their lives. Early childhood is the single most prolific period of development for children—90 percent of a child’s brain growth occurs between birth and the age of three. Children in poverty, however, frequently do not have access to the same educational and developmental resources as their counterparts from higher-income families during this vital time. Researchers estimate, for example, that children from professional families are exposed to 45 million words by the age of four, while children from working-class families only hear about 22 million. Children in poverty, however, are exposed to a scant 13 million. Further, more than two-thirds of poverty-stricken households do not possess a single book developmentally appropriate for a child under five. The inequality is startling, and this early disadvantage is only compounded by these children’s lack of access to quality preschool education. Much remains to be done to improve access to preschool programs even though they expanded at a promising rate over the past decade. For instance, only 40 percent of four-year-olds are currently enrolled in state-funded early childhood education programs. This figure is even lower for three-year-olds. In fact, 10 states still have no publicly funded preschool programs of any kind. It is hardly surprising, then, that in low-income communities children enter school an average of 12 to 14 months behind their peers from higher-income brackets. These statistics are especially troubling because academic success is an important indicator of children’s future income and crime rates. High-quality preschool programs are proven to raise academic performance and give children the skills and tools to be successful and contribute to society. The results of early childhood education programs speak for themselves. Adults who participate in ECE programs show lower crime rates, and both participants and their parents enjoy higher median income rates than their counterparts who were not afforded the same opportunity. ECE participants are also significantly more likely to graduate from high school and are 2.5 times more likely to continue on to higher education. Building up early childhood education programs is also one of the smartest investments we can make. Various studies determine that on average, society sees a return of $7 for every $1 invested in early childhood education programs. Costs to our already overtaxed public school system drop significantly as participants in ECE programs are less likely to repeat grades and require costly special education programs. Decreased crime rates translate to less expense for our justice system. ECE participants’ higher income rates result in greater contributions to the tax system. ECE participants tend to consume less governmental social services such as welfare. But this number can be even higher. In one longitudinal study of at-risk children, participants in a high-quality preschool program—the High Scope Perry Preschool in Ypsilanti, Michigan—were more successful in academics than the control group by age 19, and they also developed stronger social skills and looked forward to greater economic prospects. By age 27, participants boasted lower arrest rates, higher income levels, and greater rates of high school completion. The benefits only grew as the participants aged, and they compounded by age 40. The researchers estimated that over the course of the participants’ lifetimes every $1 invested in early childhood education programs yielded more than $17 in returns to society. Quality early childhood education programs also carry marked benefits for the parents and families of young children by allowing them to participate more productively in the workforce. The research is clear: ECE programs can combat poverty and make a significant difference in our school system’s success. At a time when record numbers of children are living in poverty, programs with proven and demonstrable effectiveness such as early childhood education are of the utmost importance. The revisions to ESEA must work to align preschool programs with the K-12 educational continuum so that children transition seamlessly between preschool and kindergarten and continue to build upon skills learned in preschool. Legislators can begin by making Title I funds, which are meant to provide assistance to schools serving low-income populations, more readily available to preschool programs. As it stands, only 3 percent of Title I funds are used for early childhood education. Other ways to build high-quality preschool programs include provisions for professional development that specifically address the concerns and challenges of early childhood educators, and incentivizing the creation of high-performing preschool programs in school districts across the country. The ESEA was originally passed in 1965 as part of the War on Poverty. It’s time that we return to its original purpose by expanding and strengthening federally funded programs for early childhood education. Jennifer Rokosa is an ethnic media intern at American Progress.
. Todd R. Risley and Betty Hart, Meaningful Differences in the Everyday Experience of Young American Children (Baltimore: Paul H. Brookes, 1995).